The Youth Ambassador Board of the Eileen Fisher Leadership Institute (EFLI) would like to share with you an unique opportunity to support the growth of young people. For over seven years, EFLI’s award winning leadership development programs have helped many young people, like ourselves, to see the potential we have to be influential community members. Since 2010, we’ve been fortunate to have the generous support of Eileen Fisher, a fellow business owner. As the call for EFLI programs has grown louder, EFLI also has grown, and we are quickly expanding beyond the funding capacity of any one individual. We know it takes a village to support this work. With your support, we can create a financial aid fund for young people who otherwise would be unable to participate and ensure these transformative programs can continue for many years to come. On Sunday April 23, 2017 , we will be hosting COLOR FEST 2017, a charity walk/run and block party. Through COLOR FEST we will raise funds to provide financial aid to other young women and men who may not otherwise have access to EFLI programming. In 2015 alone, EFLI awarded over $45,000 in financial aid across six programs supporting youth in Westchester and beyond. In celebration of Earth Day, funds raised will also go to support Riverkeeper. Riverkeeper’s mission is to protect the environmental, recreational and commercial integrity of the Hudson River and its tributaries, and to safeguard the drinking water of nine million New York City and Hudson Valley residents. We are excited to share the proceeds of this event to support Riverkeeper and the environment! During COLOR FEST 2017, we are offering many ways you and your business can be involved. Your business is valuable and influential within our community and we are grateful for your continued presence. Our hope is that this event will not only be beneficial for the young women and men who participate in our programs, but will also support local businesses, by increasingvisibility and awareness of the great assets in our local communities and beyond. Please join Eileen and many others in supporting local environmental efforts and strengthening these incredible programs that have supported and empowered young people here in Westchester and beyond! WHAT IS COLOR FEST 2017? COLOR FEST 2017 is a charity run/walk and block party hosted by the young people of the Eileen Fisher Leadership Institute (EFLI) and iASK/CAB of Irvington. There will be music, dancing, food trucks, and fun as we run, walk and rise to support the environment and young people locally and around the globe. Proceeds from COLOR FEST 2017 benefit financial aid funds for participation in EFLI programs and the local environmental efforts of Riverkeeper. Through sponsoring COLOR FEST 2017, your company will become a stronger community partner, gain visibility, and have the opportunity to market directly into the hands of your customers. 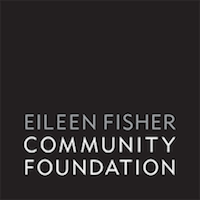 You’ll be aligning your company with the Eileen Fisher Community Foundation, an organization that engages in meaningful, impactful and conscious work in the local community. IN-KIND DONOR: Donate items or gift certificates for raffle or silent auction. COMPLETE THE FORM BELOW. QUESTIONS? CONTACT US. JOIN US AS A FEATURED VENDOR! WHAT DOES YOUR SPONSORSHIP SUPPORT? CHECK OUT THIS MESSAGE FROM ANA!